Sushil Kumar Lodhi, 32, walks about Dashehari village with newspaper clippings, which carried news of his grandfather’s death. His grandfather suffered a heart attack on his way back from Lucknow. He went there to convince officials not to build a solid waste management facility in their village because it would affect their mango orchards. But he failed to convince the officials and could not bear the shock, said Lodhi who accompanied his grandfather. The solid waste facility, a Lucknow Development Authority project, would cover 36 hectares of the Mal-Malihabad mango belt in Uttar Pradesh. Dashehari village is part of this belt and holds the reputation of having the 186-year-old ‘mother tree’ from which the dashehari variety of mangoes originated (see: Messing with history). The Lucknow authority aims to dispose of and recycle 1,300 tonnes of the city’s waste daily at the facility. Orchard owners of the mango belt are not ready to vacate their land for the facility. The farmers refused any compensation and protested at the Lucknow Development Authority’s office on July 11 and before that on the Lucknow- Hardoi highway on July 6. The project site has more than 2,000 mango trees and each tree produces more than 1,500 mangoes every year. 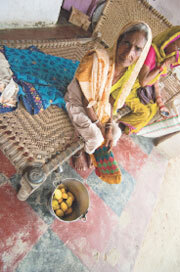 The farmers live off the sale of the mangoes. More than the facility taking away their livelihoods, farmers are worried about their identity. 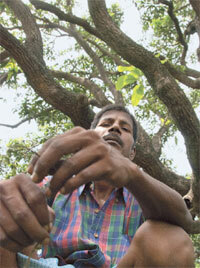 “We don’t know any other profession and will protect our mango orchards at any cost,” said Nandkishore, a resident. A committee set up in May to look into the impacts of the facility on the mango belt suggested the facility should be moved three to four kilometres from the periphery of the mango belt. The report of the committee, set up by the Expert Appraisal Committee of the State Environment Impact Assessment Authority (SEIAA), said waste disposal sites are known to emit pungent air and effluents, and heavy metal ions released from the waste cause soil and water pollution. “Mango plants are sensitive to soil, water and air pollutants and heavy metal contamination,” said the report. SEIAA, however, did not ask the Lucknow Development Authority to change the project site. It only told the implementing agency, UP Jal Nigam, to mitigate environmental degradation. Initially, around 2,000 mango trees were supposed to be felled for the project. 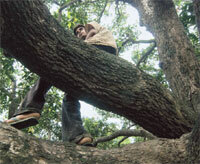 After the SEIAA asked the Jal Nigam to revise the project, it proposed a plan to fell 400 trees. Protests by orchard owners led to another revision: no trees would be felled, the Jal Nigam wrote to the Directorate of Environment on July 15. Farmers are far from satisfied. “Pollution from the plant will destroy our orchards. We don’t want the facility anywhere near us,” said Pappu Kannojiya, a resident of Dashehari. Under the UP Promotion and Protection of Fruit Trees Act, 1985, the Mal-Malihabad mango belt is meant for promotion and protection of trees. The law does not allow any “harmful project” or housing programme within a three-kilometre periphery of the belt. “Brick kilns were removed from this area. We will challenge the solid waste facility under this law,” said Amir Abbasi of Akhil Bhartiya Aam Utpadak Samiti, a union of mango growers in the region. “There is so much barren land suited for waste disposal in the municipality of Lucknow. Why don’t they build the facility there?” he asked. Jaswant Singh Yadav, pradhan (village head) of Dashehari, added there is a school, college, a wholesale market and two railway stations within five kilometres of the project site. “It is not feasible to build a facility here,” he said. Mango orchards and the waste facility are important, said Yashpal Singh, secretary to the state environment clearance committee. The committee would keep in mind both before taking a decision, he said. He refused to comment on the report that suggested change in the plant’s site. Jal Nigam, though, wants construction to begin fast. The state’s mayors are unhappy that the Jal Nigam has got the project and they have written to the state government regarding this. “The UP Jal Nigam has no experience in waste management. The municipal corporation is the nodal body for waste management of the city. 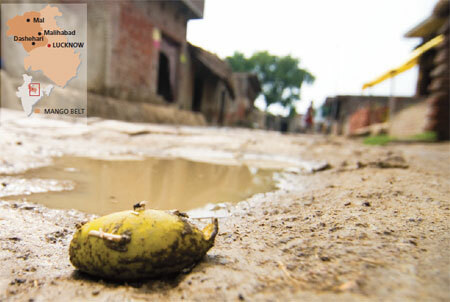 Without taking our consent, the project and the money were given to the Jal Nigam,” said Dinesh Sharma, Lucknow’s mayor. One reason for speeding things is if the Jal Nigam does not begin the project by the year end, it might have to return the money it has got from the government. The Rs 43-crore project has been delayed by four years. The Jal Nigam has received Rs 10.73 crore as the first instalment for the project. This includes Rs 5.36 crore by the Centre, which is to bear 50 per cent of the total project cost. Farmers said they got to know of the project seven months ago through the land acquisition notice. “We were told we would get jobs. We did not know about the waste management facility,” said Vijay Bahadur, a mango grower in Dashehari. The public hearing, in April, was a formality. “It was raining. Officials came, had refreshments in their tents and returned,” he added. The Jal Nigam has appealed to the district magistrate for a special permission to begin construction. Referring to the facility, P K Bhukesh, director, construction and design services of the Jal Nigam, said, “It is not harmful at all. Waste would produce manure which will benefit the mango trees.” The additional district magistrate (land acquisition) of Lucknow issued an ultimatum to landowners of Dashehari village to accept the Rs 4.6 lakh per acre (0.4 ha) compensation the state government has fixed for them, or face the court. Villagers don’t want to discuss compensation. “Money will come and go, mangoes are our livelihood. No one can take our land forcibly,” said Lodhi. Irony of law and policy: we fight the developed nations over the Kyoto protocol......and we disagree on the issue because.... "why should we sacrifice when someone else soiled the floor?"....... then why are the policy makers in India bent upon pursuing...... "let agricultural land or the luxuriant forests be taken to take up the dirt so that the so called cities be neat and tidy??"..... if this continues what will eat?.......Recycled garbage? A very good article on a very different subject. Welldone. very well written, its an issue the needs more attention as on one hand the governments(both state and central) are crying for planting more and more trees and on the other they are destroying the fruit belt !!! are they really sure what they want to do with the environment ?? ?